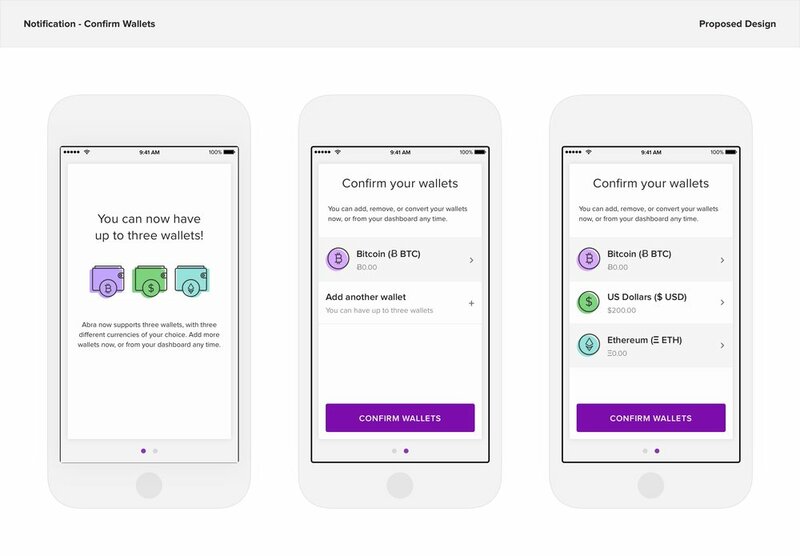 Abra is an all-in-one cryptocurrency wallet and trading platform that allows users to buy, store, and invest in 28 different cryptocurrencies. Before Abra’s business model evolved to focus on cryptocurrency investing and trading, Abra was a global, peer-to-peer, digital cash, money transfer app. As Abra’s business model evolved, frequent updates to the site were needed. Abra continued to expand their offerings and hone in on their messaging as more and more cryptocurrencies were supported. 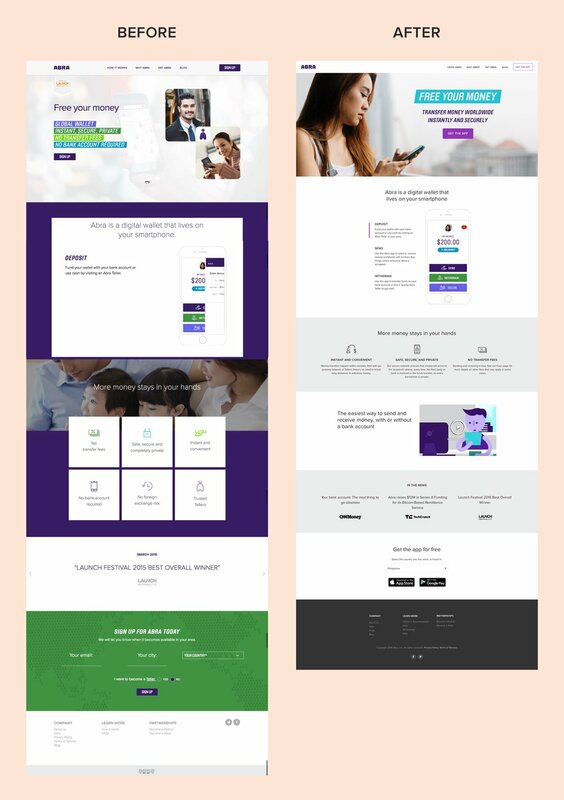 I worked with the VP of marketing to make frequent updates to the site based on stakeholder input on key areas of the site, especially on the homepage. Because there were frequent updates, I used modular components that could be reused throughout the site, and came up with a solution to be able to replace iOS screenshots easily without having to go through a designer. Goal: Extend the functionality of buying bitcoin on the web to help achieve revenue growth and lead generation for the Abra app by creating an affiliate program to drive partnerships. 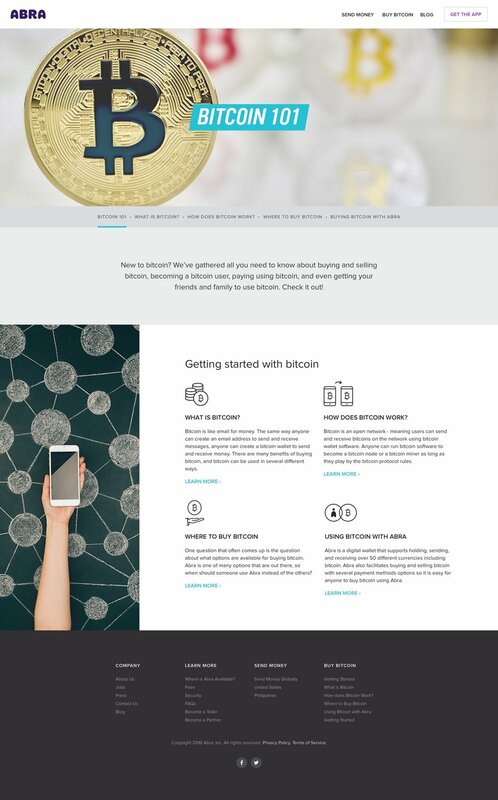 Remove colored header background and logo from title bar for a more modern approach and to reduce visual "clutter"
Reduce unnecessary headings/text to reduce visual "clutter"
Before Abra’s business model evolved to focus on cryptocurrency investing and trading, Abra was a global, peer-to-peer, digital cash, money transfer app. Abra used Blockchain technology for secure money transfers and payments while protecting the value of deposits in local currency. 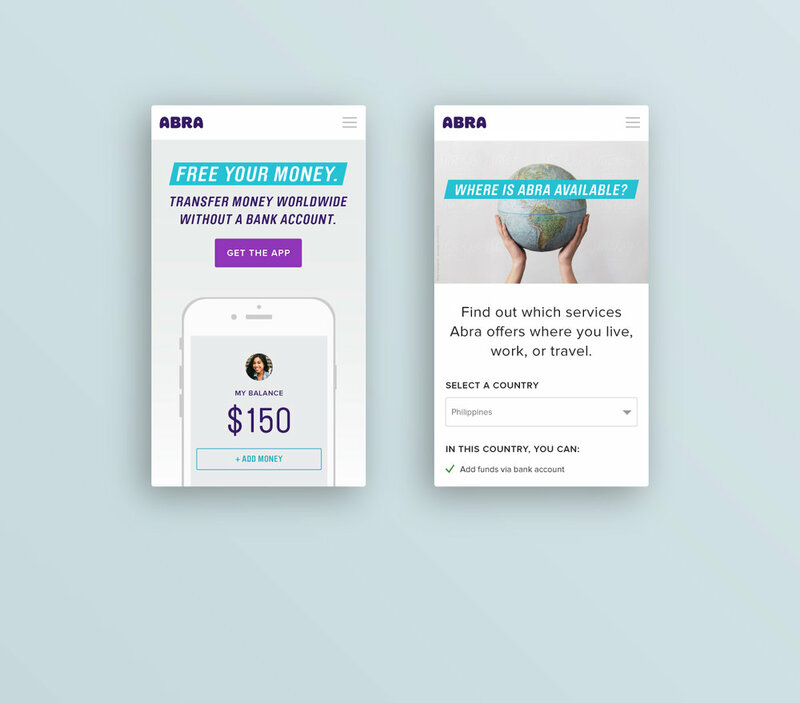 Challenge: Abra was preparing for an app release and wanted to quickly modernize their website to better reflect their brand, as well as make it as easy as possible to download the app. Process: I worked closely with the VP of Marketing to refine elements of the Abra brand while simultaneously redesigning their website to have a more modern appearance with improved typography, iconography, and photography. Because we were working on a tight deadline, we used some existing elements. We clarified the copy across the site, including on the main call-to-action button on the homepage, and reduced emphasis on competing buttons to improve conversions on app download. Outcome: The result was a much simplified mobile-friendly website that better reflected the direction of Abra’s brand. Challenge: There were several use cases for for the App download process on the website depending on whether or not the user's location and device were detectable, and if the App was supported in their country. The goal was to streamline each scenario. Process: I examined the current flow and looked for ways to reduce friction for the user to download the app. I created wireframes to clearly indicate each use case and communicate the appropriate design to the developer. Outcome: The App download process was simplified and barriers to download were removed. 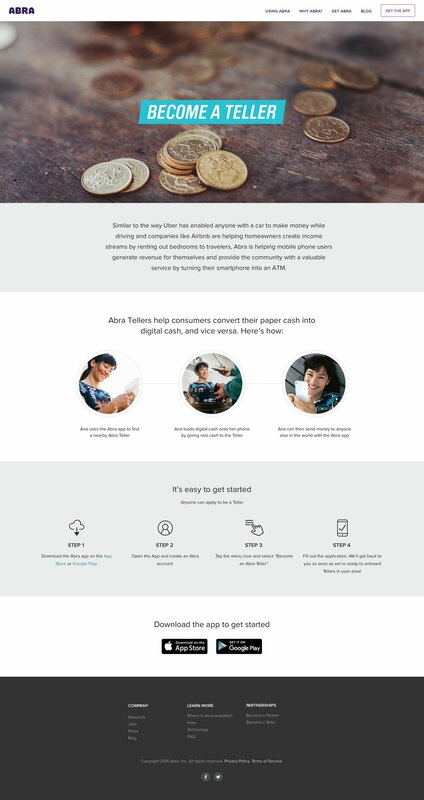 As Abra’s business model evolved, I was tasked with updating the site with frequent additions, including a microsite for information about bitcoin that was meant to boost SEO and to showcase Abra as a thought leader on cryptocurrency trading. Tara has a great aesthetic sense and helped me think through site structure and even content. Because the initial work she delivered was so on target, there was very little back and forth in terms of design iterations. Throughout the process, she was highly organized, fast, meticulous, responsive, and just all around pleasant to work with.